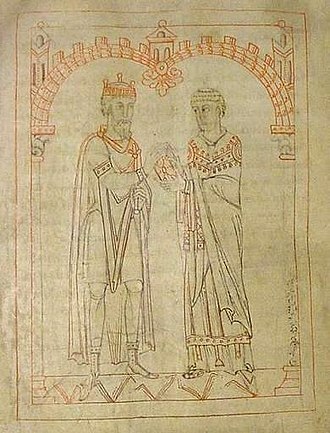 Alfonso X (also occasionally known as Alphonso, Alphonse, or Alfons, 23 November 1221 – 4 April 1284), called the Wise (Spanish: el Sabio), was the King of Castile, León and Galicia from 30 May 1252 until his death in 1284. 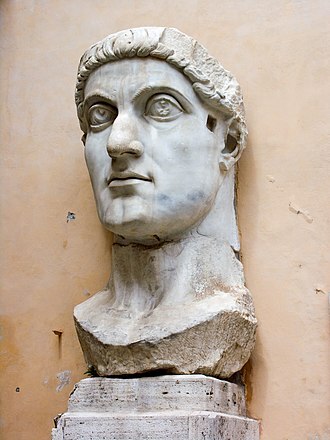 During the imperial election of 1257, a dissident faction chose him to be King of the Romans (Latin: Rex Romanorum; German: Römisch-deutscher König) on 1 April. 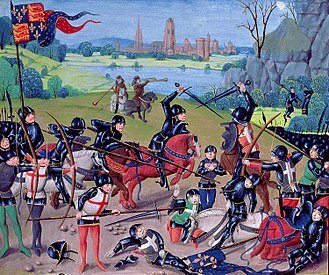 He renounced his imperial claim in 1275, and in creating an alliance with England in 1254, his claim on Gascony as well. In 1256, at the death of William II of Holland, Alfonso's descent from the Hohenstaufen through his mother, a daughter of the emperor Philip of Swabia, gave him a claim through the Swabian line. 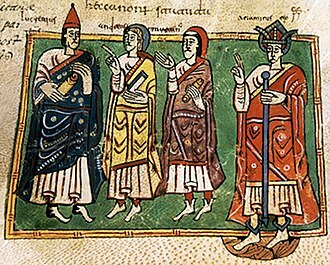 Alfonso's election as King of the Romans by the imperial prince-electors misled him into complicated schemes that involved excessive expense but never succeeded. Alfonso never even traveled to Germany, and his alliance with the Italian Ghibelline lord Ezzelino IV da Romano deprived him of the initial support of Pope Alexander IV. 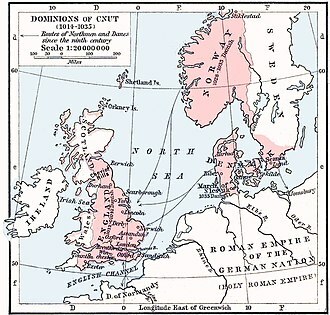 His rival, Richard of Cornwall, went to Germany and was crowned in 1257 at Aachen. In the end, after Richard's death, the German princes elected Rudolph I of Habsburg (1273), Alfonso being declared deposed by Pope Gregory X. 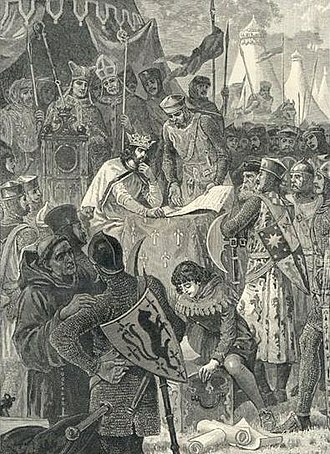 In 1275 Alfonso tried to meet with his imperial vicar in Italy, William VII of Montferrat (who had succeeded Ezzelino) and his Ghibelline allies in Piedmont and Lombardy to celebrate the victory against the Guelph Charles I of Anjou and be crowned in Lombardy; he was however halted in his imperial ambitions in Provence by the Pope who, after a long negotiation, obtained Alfonso's oral renunciation of the title of King of the Romans. 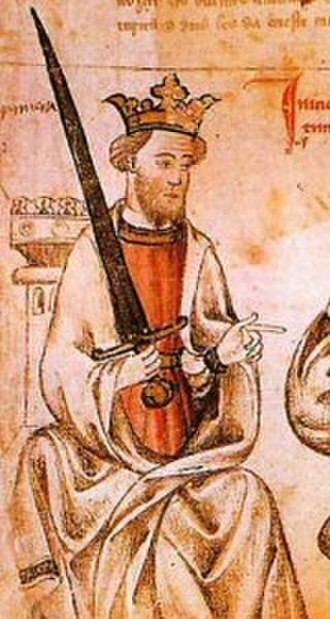 Ferdinand de la Cerda, Infante of Castile (23 October 1255 – 25 July 1275). He married Blanche, the daughter of King Louis IX of France, by whom he had two children. Because he predeceased his father, his younger brother Sancho inherited the throne. ^ The medieval church : the world of clerics and laymen. Burns, Robert I., Alfonso X, King of Castile and Leon, 1221-1284., Scott, Samuel Parsons. Philadelphia: University of Pennsylvania Press. 2001. pp. xix. ISBN 9780812217384. OCLC 847550277. Violant of Hungary was a Queen consort of Aragon and the second wife of King James I of Aragon. She is called Jolánta in Hungarian, Iolanda or Violant dHongria in Catalan, Violant was born at Esztergom circa 1215, the only child of King Andrew II of Hungary and his second wife Yolanda of Courtenay. 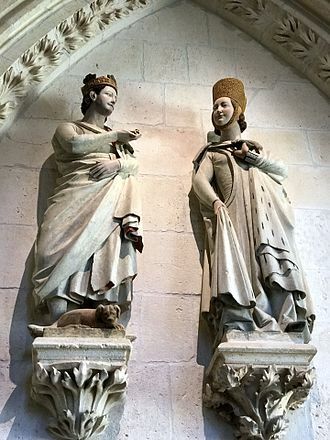 James had already married to Eleanor of Castile, but he had this marriage annulled on the basis of consanguinity in 1229. 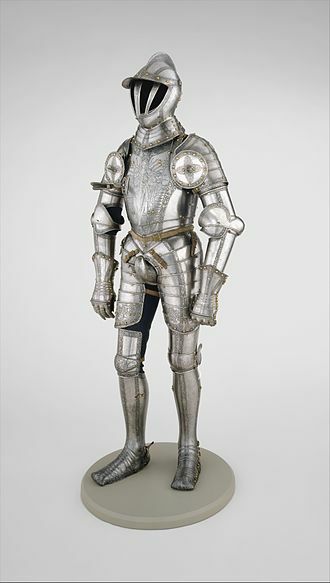 He and Eleanor had a son named Alfonso, who was considered legitimate, charles was the father of Philip VI of France. Violant was a woman of talent and character, next to James I, she had an important political role in the Crown of Aragon. 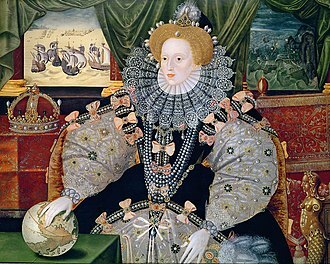 She was one of the most valuable advisors of the king and she intervened decisively in international agreements as important as the Treaty of Almizra with Castile. 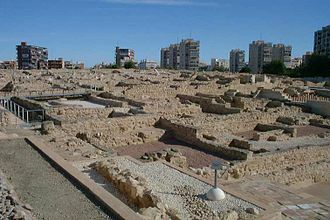 It was signed with the condition that Zayyan ibn Mardanish surrender of the city of Valencia, Violant reportedly died in 1251, although there is some doubt about the exact year. Zurita continues that her will stipulated her burial at Vallbona, bequeathed the county of Posana to her sons Peter and Sancho, Violant and her daughter Sanchas remains are at the Monastery of Santa Maria de Vallbona in Vallbona de les Monges, Catalonia. Violant chose burial in that monastery as she was a benefactor and her tomb, placed along the wall on the right of the chancel, is fairly simple. It is raised on two pillars decorated with individual gold crosses inscribed in red circles, and has a lid of white stone. In the center of the lid is a cross with the characteristics as those on the pillars. The only ornamentations on the box itself are three depictions of her husbands royal coat of arms - one on the side and one at each end. The Queens remains were moved to the tomb in 1275, as indicated by the inscription on the side of the box. In 2002, the Hungarian government financed a restoration of her tomb, costing 12,000 euros, Violant is the only member of the Árpád dynasty whose remains are undisturbed. 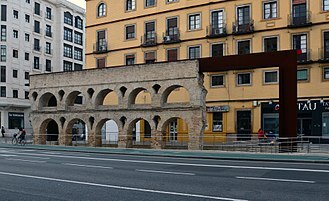 James I remarried one more time, to Teresa Gil de Vidaure, since the nineteenth century, streets have been dedicated to Violant in Barcelona and other cities in the counties and kingdoms of the former Crown of Aragon. The 9th of October is the day of the Valencian community, which commemorates the Christian reconquest. In the Middle Ages, the Galician-Portuguese lyric, sometimes called trovadorismo in Portugal and trobadorismo in Galicia, was a lyric poetic school or movement. All told, there are around 1680 texts in the so-called secular lyric or lírica profana, at the time Galician-Portuguese was the language used in nearly all of Iberia for lyric poetry. From this language derives both modern Galician and Portuguese and it is the earliest known poetic movement in Galicia or Portugal and represents not only the beginnings of but one of the high points of poetic history in both countries and in Medieval Europe. 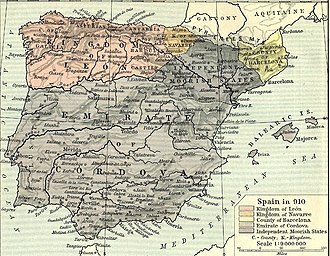 Modern Galicia has seen a movement called Neotrobadorismo. The earliest extant composition in this school is usually agreed to be Ora faz ost o senhor de Navarra by João Soares de Paiva, the troubadours of the movement, not to be confused with the Occitan troubadours, wrote almost entirely cantigas with, monophonic melodies. Their poetry was meant to be sung, but they emphatically distinguished themselves from the jograes who in principle sang and it is not clear if troubadours performed their own work. Beginning probably around the middle of the century, the songs, known as cantares, cantigas or trovas. Three such anthologies are known, the Cancioneiro da Ajuda, the Cancioneiro Colocci-Brancuti, all three are lyric genres in the technical sense that they were strophic songs with either musical accompaniment or introduction on a stringed instrument. But all three have dramatic elements, leading early scholars to characterize them as lyric-dramatic. The origins of the cantigas damor are usually traced to Provençal and Old French lyric poetry, the cantigas damigo are probably rooted in a native song tradition, though this view has been contested. The cantigas descarnho e maldizer may have local roots. The latter two make the Galician-Portuguese lyric unique in the entire panorama of medieval Romance poetry. List of Galician-Portuguese troubadours A = “Cancioneiro da Ajuda”, Biblioteca do Palácio Real da Ajuda, N = Pierpont Morgan Library, MS979. S = Arquivo Nacional da Torre do Tombo, Capa do Cart, not. The book consists of ninety-seven leaves of parchment, many with color illustrations, and contains 150 miniatures. The text is a treatise that addresses the playing of three games, a game of skill, or chess, a game of chance, or dice, and a game, backgammon. The book contains the earliest known description of these games and these games are discussed in the final section of the book at both an astronomical and astrological level. Examining further, the text can be read as an allegorical initiation tale and as a guide for leading a balanced, prudent. In addition to the didactic, although not overly moralistic, aspect of the text, the manuscript’s illustrations reveal a cultural, social. It is one of the most important documents for researching the history of board games, the only known original is held in the library of the monastery of El Escorial near Madrid in Spain. The book is bound in sheepskin and is 40 cm high and 28 cm wide, a 1334 copy is held in the library of the Spanish Royal Academy of History in Madrid. Alfonso was likely influenced by his contact with scholars in the Arab world, unlike many contemporary texts on the topic, he does not engage the games in the text with moralistic arguments, instead, he portrays them in an astrological context. He conceives of gaming as a dichotomy between the intellect and chance, the book is divided into three parts reflecting this, the first on chess, the second on dice, and the last on tables. The text may have influenced by Frederick IIs text on falconry. The Libro de juegos contains a collection of writings on chess, with over 100 chess problems. Among its more notable entries is a depiction of what Alfonso calls the ajedrex de los quatro tiempos and this game is a chess variant for four players, described as representing a conflict between the four elements and the four humors. The chessmen are marked correspondingly in green, red and white, Alfonso describes a game entitled astronomical chess, played on a board of seven concentric circles, divided radially into twelve areas, each associated with a constellation of the Zodiac. The Mesta was a powerful association of sheep ranchers in the medieval Crown of Castile. The sheep were transhumant, migrating from the pastures of Extremadura and Andalusia to León and Castile, the no-mans-land between the Christian-controlled north and Moorish-controlled south was too insecure for arable farming and was only exploited by shepherds. When the Christians conquered the south, farmers began to settle in the grazing lands, the Mesta, set up in the late 13th century, can be regarded as the first, and most powerful, agricultural union in medieval Europe. The export of merino wool enriched the members of the Mesta who had acquired ranches during the process of Reconquista, two of the most important wool markets were held in Medina del Campo and Burgos. The kings of Castile conceded many privileges to the Mesta, the cañadas are legally protected forever from being built on or blocked. 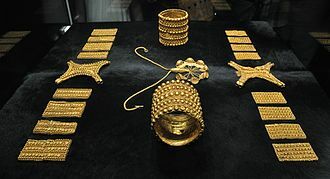 The most important cañadas were called cañadas reales, because they were established by the king, the word comes from Latin animalia mixta, referring to the diverse ownership of the animals among nobles and the Church. First page of a 1555 version of the Siete Partidas, as annotated by Gregorio López. 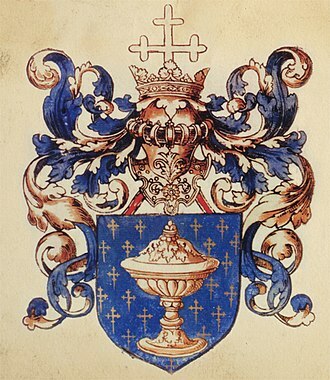 Arms of Castile and León. Painting of Alfonso X of Castile, father of Alfonso Fernández "el Niño".